Cloned from Poe Leroux by PhaistosDisk, Cincinnati Slim by PhaistosDisk. See also Retro Future Striped by PhaistosDisk, Tranquil by PhaistosDisk, Retro Future II by PhaistosDisk. 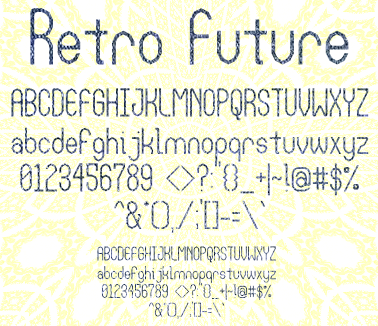 A bauhaus style font. Basic latin, more latin, and extended latin A characters included. Info: Created on 25th September 2009 . Last edited on 28th September 2009. Excellent set with some drop dead gorgeus glyphs.